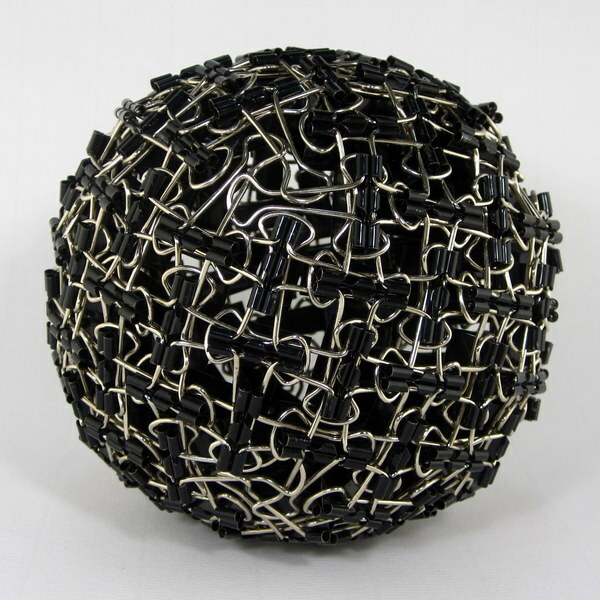 A dense metal mesh constructed from 132 binder clips (and pliers). Designed and constructed in April, 2011. A view down a 4-fold axis of symmetry. A view down a 3-fold axis of symmetry. 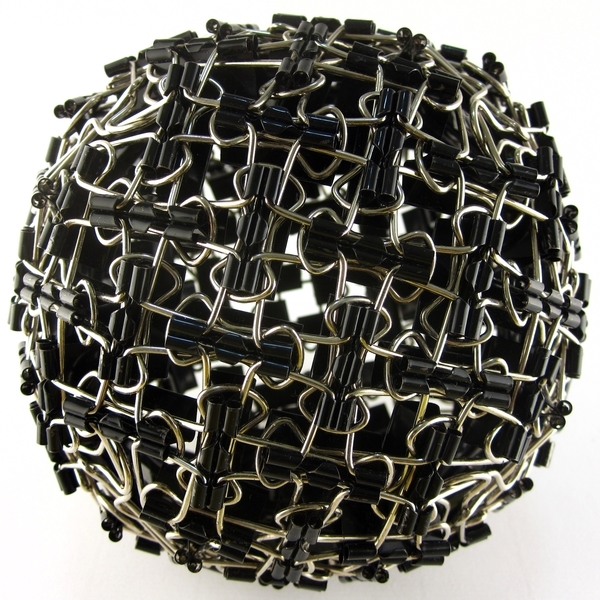 The Impenetraball protects its hollow interior with a dense, chainmail-like mesh made from 132 binder clips. The weave pattern complements the dimensions of these binder clips, exploiting the fact that a handle just barely fits around the body of a neighboring clip (both lengthwise and widthwise). This also makes for an assembler's worst nightmare; a good pair of small needle-nose pliers and a great deal of patience are essential. In return, the structure is impressively sturdy—it could probably support my full body weight, though I have yet to confirm. The geometric structure is based on a cube, but with a twist. 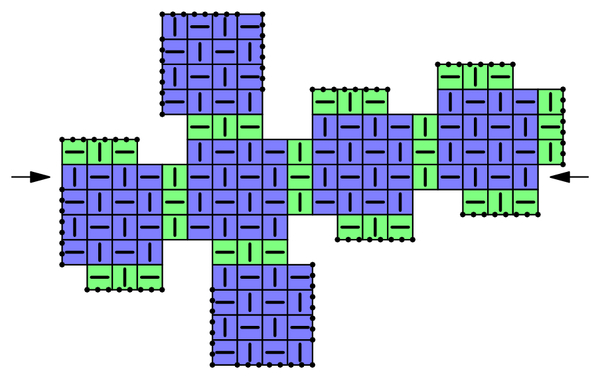 Six squares (each a \(4\times 4\) grid) are connected to each other in a cube-like formation with offsets (namely, \(1\times 3\) rectangles), creating a slightly disorienting spiral effect. The schematic image below illustrates this pattern. As the arrows illustrate, there are long, straight, 19-clip paths that wind their way around the cube and terminate at the triangular "holes" in the corners. Make sure to locate these paths in the images above. How many are there? A schematic layout of the Impenetraball illustrating the "twisted" cube structure. 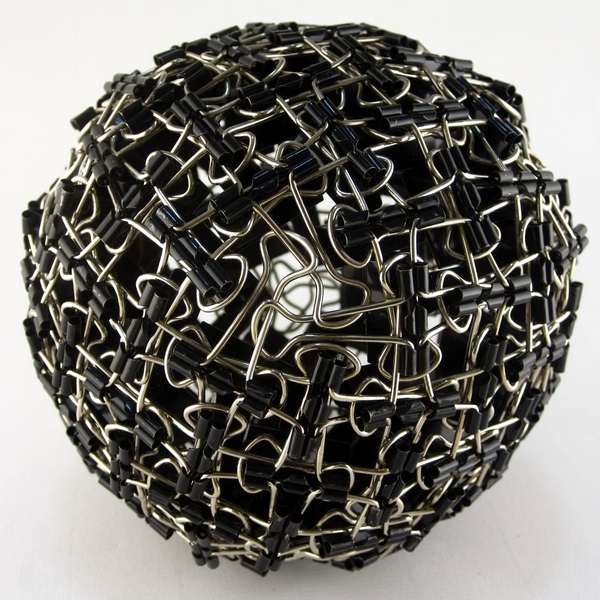 Small squares represent clips, and ticks illustrate the orientations of the clips. Dotted lines are locations where the surface has been cut. UPDATE: I have received many requests for instructions, so if you want to try to make your own, I have posted a guide here. But be warned: it's not easy. Good luck!